Church Health Center. (901) 272-7170 . chreader@churchhealthcenter.org. How does the Church encourage and maintain spiritual, emotional, physical and social well-being in a world of stress, violence, confusing value systems and social turmoil? The quarterly Church Health Reader recognizes these challenges and offers practical, timely instruction and helpful options. Available both electronically and in print, Church Health Reader speaks to both personal and community well-being from the holistic standpoint. Past issues offer articles on healing the roots of moral injury and trauma, the gift of spiritual direction, the benefits of walking and putting out the welcome mat. "Model Moments", a new section added to each quarterly publication, highlights exemplary ministries on six topics: Faith Life, Medical, Movement, Work, Emotional, Nutrition, and Friends & Family. 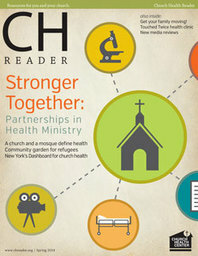 Whether beginning or growing a congregation's health ministry, Church Health Reader provides clergy and congregations a diverse array of ideas and resources.